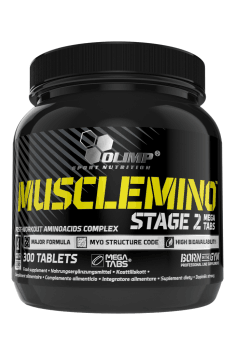 Olimp Musclemino Stage 2 is a unique amino acid preparation containing a set of proteogenic amino acids, which thanks to a specially selected proportion of the individual components effectively affects the post-workout regeneration of muscle tissue. The supplement has a unique content of individual amino acids, which is similar to the ratio in which the microfibril proteins of the muscle tissues – actin and myosin – are built. Based on the available knowledge, it is believed that it is actually the appropriate mutual amino acid ratio, not their quantity, that has a key impact on the regeneration and building of muscle tissue. A daily turnover rate of skeletal muscle proteins is 1.2% in healthy and active people. In fasting state, muscle protein breakdown (MPB) outstrips the synthesis of muscle proteins (MPS). In response to physical effort, both MPS and MPB increase. In both cases, in order for MPS to be higher than MPB, proper supply of exogenous nutrients is necessary. By focusing exclusively on the role of proteins, the proper intake of amino acids is crucial. The two main factors that determine the total amount of skeletal muscle mass are physical activity and the availability of nutrients. The anabolic effect of nutrition is mainly conditioned by the transfer and inclusion of amino acids picked up from protein food sources to build skeletal muscle proteins. The goal of the whole process is to compensate for the loss of muscle protein during periods of increased breakdown. Consumption of essential amino acids after a workout increases both the extent and duration of MPS growth and thus determines the subsequent training adaptation. The lack of amino acids after exercise causes a greater breakdown of muscle protein. The result is a negative nitrogen balance of muscle tissue, and consequently no training effects. If this condition persists throughout the entire training cycle, skeletal muscle loss and sports regression are observed. It is not possible to build muscle without a set of essential amino acids. In order for proteins contained in ordinary food to be used by the body, they must first be digested and then absorbed in the form of amino acids. The duration of this process depends on the type of protein and ranges from a few to even a dozen or so hours. In order to reduce MPB and increase MPS after a workout, it is necessary to supply the body with protein as quickly as possible. The best way to do this is to take amino acid preparations. They enable omitting the whole process of protein digestion, thus ensuring the access to the access to these important ingredients here and now. In addition, amino acid preparations are very easy to use. There is no need to carry any container with cold food, or packaging with protein powder and a shaker. All you have to do is to pack a required number of capsules, to be swallowed right after a workout with a sip of water. Then, you can carelessly go back home and while being properly supported you can start having fun with the preparation of a wholesome meal. In summary, Olimp Musclemino Stage 2 is a dietary supplement that is intended for both physically active sports enthusiasts and professional athletes. The preparation improves the effective restoration of muscular proteins destroyed during exercise, and thus speeds up the training adaptation and facilitates building muscle mass. Musclemino Stage 2 300 tab. Take immediately after training. Dosing is dependent on body mass: up to 80 kg – 5 tablets; above 80 kg – 8 tablets. The dosage of the preparation can also be adjusted depending on body weight. People whose body weight exceeds 80 kg are advised to increase the dose. To increase the effectiveness of this preparation, we recommend combining it with a pre-workout product of a similar purpose - Stage 1. Both products form a complementary set. Bulking agents - microcrystalline cellulose, calcium carbonate, carboxymethylcellulose sodium crosslinked; whey protein hydrolyzate (from milk), bovine protein hydrolyzate, anti-caking agents - magnesium salts of fatty acids, silicon dioxide. Asparagine is an endogenous amino acid, synthesized directly in the human body, and also in foods containing high amounts of plant and animal protein. It is also available as nutrients, supplements and mineral preparations (e.g. Magnesium or zinc aspartate [ZMA]). It participates directly or with support of synthetics in physiological processes: energy conversion, synthesis of purines and urea. Its derivative (asparagine) with phenylalanine (exogenous amino acid) is a part of aspartame [E-951]. There is more and more positive feedback from athletes about the usefulness of its equivalent d-aspartic acid to increase the of testosterone potential.